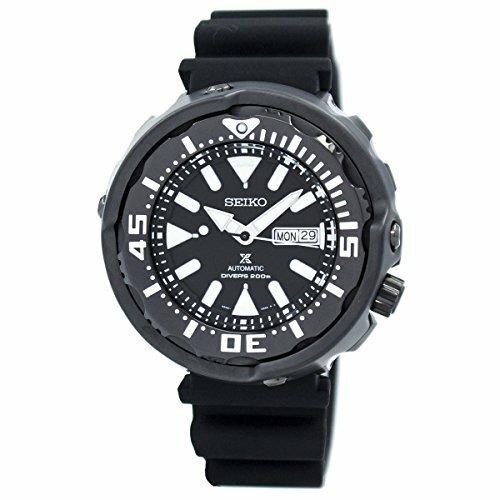 Seiko SRPA81K1 Prospex men’s automatic dive watch features a 52mm wide and 13mm thick black ceramic and black ion plated solid stainless steel case with a one way rotating bezel and textured screw down crown. Seiko SRPA81K1 is powered by Japanese 4R36 automatic movement with 24 jewels. This stylish watch also features a sharp looking black dial with white accents silver tone luminous hands and index hour markers along with the 41 hours power reserve and day-date display functions, scratch resistant hardlex crystal and water resistant to 200 meters.